Maybe you don't know: Shazam is the real Captain Marvel! Maybe you don’t know: Shazam is the real Captain Marvel! In early March, Marvel broke the first shot of the year when it launched Captain Marvel – the premise for the upcoming blockbuster Endgame. However, few people know that Carol Danvers is not the first to carry this title. “The true Captain Marvel” is the rival superhero that debuted after less than a month – Shazam. Shazam and Superman on comics in 1940. In 1939, Fawcett Comics released Captain Marvel’s superhero. The series revolves around a boy named Billy Batson who is bestowed with a powerful power by the wizard Shazam just by shouting his name. However, DC Comics at the time thought that this superhero had “learned” Superman and was determined to sue. After a long time, Fawcett Comics stopped publishing Captain Marvel in 1953 and in 1972 sold all the rights to DC. Unfortunately, they forgot the copyright registration of this name and Marvel was one step ahead of Captain Marvel # 1 around Mar-Vell in 1968. By the time it was published again, DC was not allowed to use Captain Marvel on the cover of the book or other line of toys. They had to rename the series to Shazam but still kept the nickname Captain Marvel for Billy Batson. The company also tried to include the “true Marvel Marvel” title on the cover, but was immediately sent “Marvel” by Marvel. 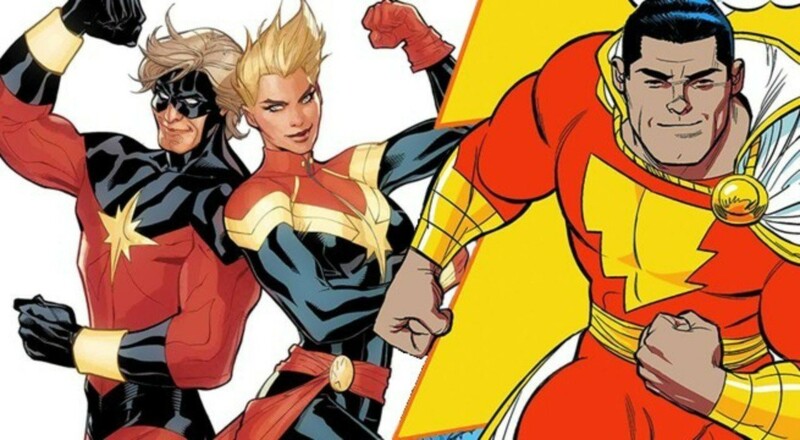 By 2011, with the series re-launching the entire universe, New 52, ​​DC officially changed the name of Captain Marvel to stick with the character for 70 years into Shazam. What is the power of Shazam? The name Shazam is also the symbol of the superpower of the guy when paired from 6 names Solomon, Hercules, Atlas, Zeus, Achilles and Mercury. When shouting the spell, the boy Billy Batson will turn into a “6 pack” mature version with King Solomon’s “know-how” mind, Hercules’s unrivaled health, Atlas’ indestructible body, Zeus’s immortal and thunderous ability, Achilles’ indomitable will and Mercury’s super speed. The guy named Earth’s Mightiest Mortal and one of the rare superheroes who can beat Superman. The only weakness of Shazam is the “young buffalo” character of the boy Billy Batson. In the original comic, Shazam’s first enemy is Doctor Sivana – a scientist and criminal with genius wisdom. In addition, his left eye also possessed the ability to see magic. Thanks to his superior intelligence, Sivana invented many high-tech weapons to confront Shazam or even a remedy to help him walk through all objects. Doctor Sivana’s film version played by Mark Strong with almost distinct power. In addition, Shazam has another longtime enemy, Black Adam. This is considered the evil predecessor of the guy from ancient Egypt with the power of the gods Shu, Haru, Amon, Zehuti, Aton and Mehen. With the same power, Black Adam became the longest and most difficult rival of Shazam. Dwayne Johnson was DC “chosen to send gold” to play this anti-hero (anti-hero) on the big screen. The success of Shazam! will help this work quickly go into production. Shazam will open a new direction for DCEU? “Shazam” is DC’s “muddy” superhero movie. Unlike Batman, Superman or Wonder Woman, Shazam is just a kid with a “muddy” part. Therefore, Warner Bros. filmmakers. can unleash “loose” so that the character can freely play, learn and grow. The power of the child with the heart of a child is what helps the guy who is different from those who carry on him the pain and responsibility in the Justice League. This is probably the new and different direction for DCEU.